I’m truly not one to complain or swell on the negative, yet I think you should know my story. 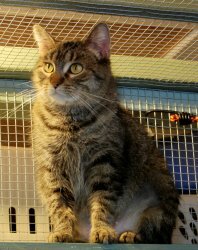 Roni is my name and I happen to be a gentle, kind, demure and somewhat timid tabby. Just over a year of age, I was discovered in a cardboard box covered with duct tape on the front steps of an area home. Why would a human being do that? Not only was it irresponsible and insensitive, it was just plain cruel. Yet for that one terrible action, there have been many acts of generosity on my behalf. Fortunately for me, the cardboard prison that held me was left at the home of a very kind and compassionate family who did the right thing. They contacted the Emmet County Animal Shelter and now I’m ready to find the loving family I so deserved from the start. At the moment I’m living with a foster family in a specially constructed “cattery” for me and the other kitties awaiting adoption. While some of my feline roommates find it necessary to rough house, I will always be perched up high witnessing their crazy antics. When dinnertime rolls around I always mind my manners and wait for the other kitties to eat. The same goes with attention, once everyone else has had their fill, I’ll slowly descend from my perch and accept all of the unconditional love and attention my foster family has to offer. Love is something I lived without, so do I ever relish the time I have with those who adore me! My coat of short brown tabby fur feels like that of a velveteen rabbit. As far as looks go, I’m above average. I know, I should toot my own horn a bit more, yet remember that I live with other cats who meow nonstop about how smart they are, how much prettier they are than that Siamese living on N. 14th St. I’m fine with being humble! The average life of an indoor cat is 12-14 years. Think about it, people. If I’m living the good life indoors I’m safe from predators, speeding vehicles and neighborhood pranksters. What a grand life that will be. Having my very own people and sunshine-filled window to look out of. Life will be great one day for me thanks to adoption! While I was mistreated and left in a terrible situation, volunteers from the Emmet County Animal Shelter are working their hearts out to find the quiet, nurturing and committed family I long for. Once I get to know you, you’ll have my friendship for life. If you’d like to see if I’m your special someone, please give my friends at the shelter a call or drop them an email.